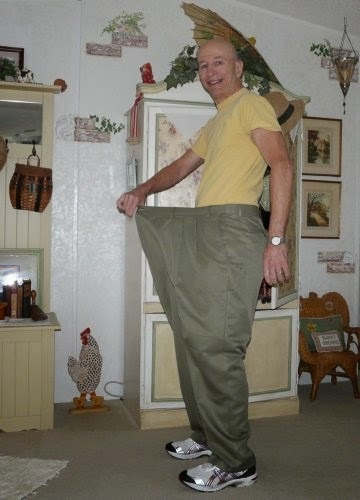 "I figured that if I could lose 203 pounds, I could do anything. Back when I was heavy, I used to spend a lot of time plopped on my backside watching TV and reading. I often thought to myself that I could write a nice story but I just didn't have the energy. Not so with the new me. I decided to try my hand at writing and with the help of a friend, Joanne Augello, who kept me on course, I recently finished my first story, a novella entitled Flight from the Wild Side. The process was so much fun, I'm already working on another story." So declared weight loss inspiration turned writer M. J. Toscano when I spoke to him at Joe Muggs in Port Richey, FL. "I love it here," he said. "I can read, drink coffee and chat with my friends in the friendliest of environments - a bookstore." We, of course, wish him much success with his writing career. We read Flight from the Wild Side and think it's a great beginning. "Are you afraid that success might lead to increased eating and a weight gain?" we asked. "No, I'm not afraid at all," he responded, adding, "Please pass me another donut."